I am a sculptor, blacksmith and outdoor events artist working in metal. My inspirations come primarily from nature, organic forms, and the beauty and character of the materials, often illustrated through fire. I started welding in 2002 constructing sculptures from scrap metal, I then went on to study at Hereford College of blacksmithing and metal work. In 2007 I returned to the north where I now live and have a workshop. I design and create sculptural forms using repoussé extensively, alongside contemporary and traditional blacksmithing techniques. My aim for the viewer is to find my work both elegant and curious. As an artist I have built a vocabulary of forms, materials and methods that define my work. By applying this vocabulary to metal I create graceful organic forms from a hard unforgiving material. My most recent works are figurative. 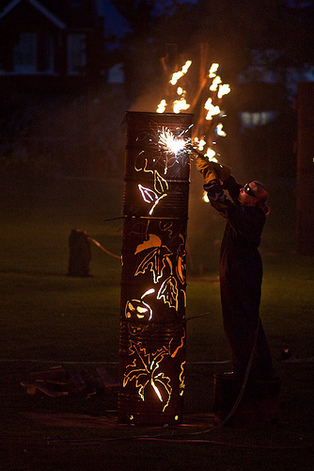 In 2008 I started freelancing for Salford based outdoor art events company Walk the Plank, and have enjoyed being involved in their many projects both at home and internationally.